Writer Keith Richardson paints a portrait of rural life - Cumbrian style! Leafing through Keith Richardson's new book, Ivver Sen, was a real treat. 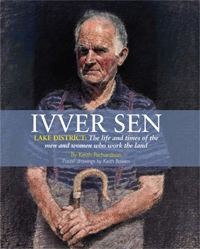 Not only has the former newspaper journalist and magazine editor put together an enthralling historical record of parts of the rural life of Cumbria, but the pictorial assistance of artist Keith Bowen has been instrumental in creating a work of art too. At first glance, the cover picture reminded me very much of my wife's granddad, a farmer himself and one of the nicest people you could ever wish to meet. He was also a pal of Jonny Birkett, one of the many legends of country life in Cumbria featured in Keith's book. For the record, Ivver Sen is Cumbrian dialect for 'ever since,' which is apparently a direct reference to the many years hill farming has existed in our green and pleasant land. Before I wax lyrical about the book, let me give you a little background on the well respected, Keswick born and bred, writer. Prior to finding his true vocation as a man of words, Keith tried his hand at a variety of jobs ranging from factory worker for Cumberland Pencils, nightshift worker at British Gypsum, as well as a stint as a coal deliveryman. Meanwhile though, he was developing a growing interest in writing and the arts and made his debut in print with a freelance article published in Cumbria magazine. In the early 1970s he managed to get a job as a junior journalist on The Whitehaven News. He stayed at the west coast title for ten years before moving to The Cumberland News and the News and Star as a sub editor. From there he moved to the editor's chair of Cumbria Life and performed a joint role as editor of the free newspaper The Cumbrian Gazette as well as the magazine and other titles. In 1989 he landed the UK Press Gazette Free Newspaper Editor of the Year award. In the late 1990s, Keith was made publishing director / editor of Cumbria Life magazine. Last year he stepped down at the age of 57 to establish his own business, the River Greta Writer publishing house, based in Keswick, which takes its name from the river that flows through the town. Anyway, back to Keith's book, which is packed with fascinating stories of rural greats, such as fell runner and farmer Joss Naylor, hounds man Tommy Graves and renowned Herdwick breeder Jean Wilson. Glenn Tubman, the man behind the microphone at many shepherd meets and agricultural shows, is featured, as is George Crayston, who farms at Thornholme, in the dip between Cold Fell and Swainson Knott close to the West Cumbrian village of Calderbridge, nestled below prehistoric settlements, cairns and stone circles within sight of Sellafield's nuclear plant, which hugs the coastline. There is also the remarkable stories of siblings Johnny and Betty Richardson, who spent an idyllic childhood at Watendlath in the early 1930s, before Johnny - who later became a well-known huntsman - went off to war and was himself, as Keith describes, 'hunted like a fox,' across the Appennines mountain range in Italy by German soldiers, after he escaped, not once but three times, following his capture in Tobruk in 1941. Ivver Sen is the culmination of five years hard graft for Keith traipsing in his own well-polished favoured brogues among the rural farming folk of Cumbria. A task he undoubtedly enjoyed, with an affinity with the people that comes across in the glossy hardback beautifully. He has captured the human side of the men and women who work the land, their amazing stories, moving and humorous, informative and entertaining. Keith's tome is rich in every sense and a glorious celebration of a changing way of life. And, for me, all the more appealing because of Keith Bowen's high-calibre pastel images, which complement the words wonderfully and paint a sensitive portrait of each individual. Every picture really does tell a story. I must mention too, the stunning landscape photographs taken by Val Corbett, who Keith has worked with over the years. All in all, an award winning gem if I ever did see one.